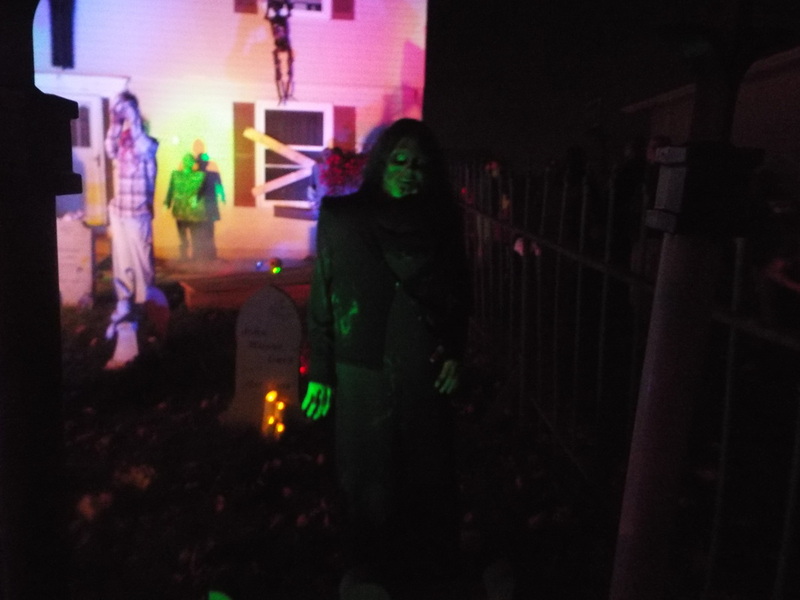 Resurrection Cemetery is a haunt that we have had on our list for a couple of years now, but for some reason, even though we go to Plainfield every year, we somehow managed to miss it. 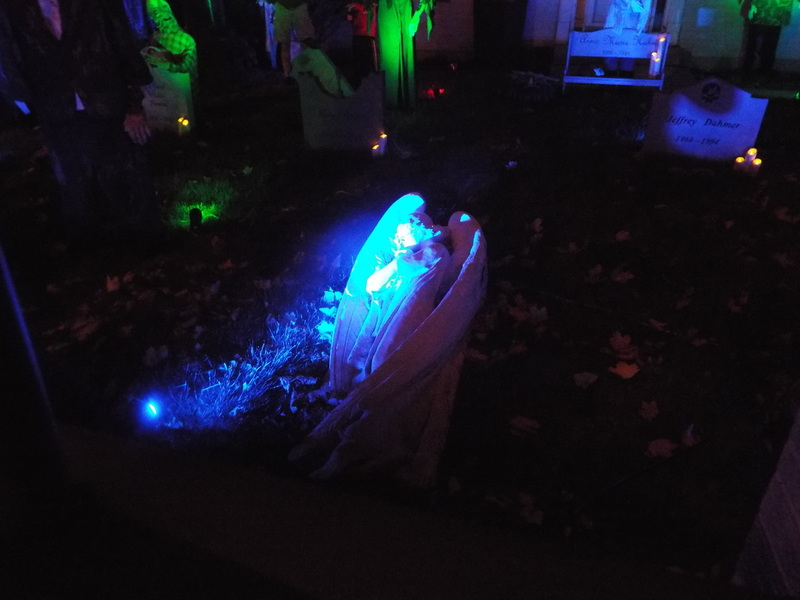 Thus, we made a point of stopping by there this year, and we're very glad we did! 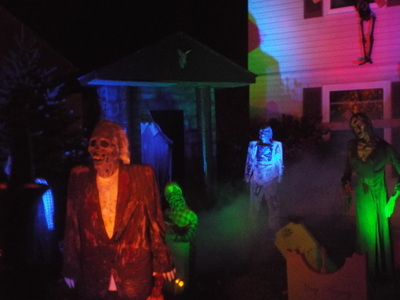 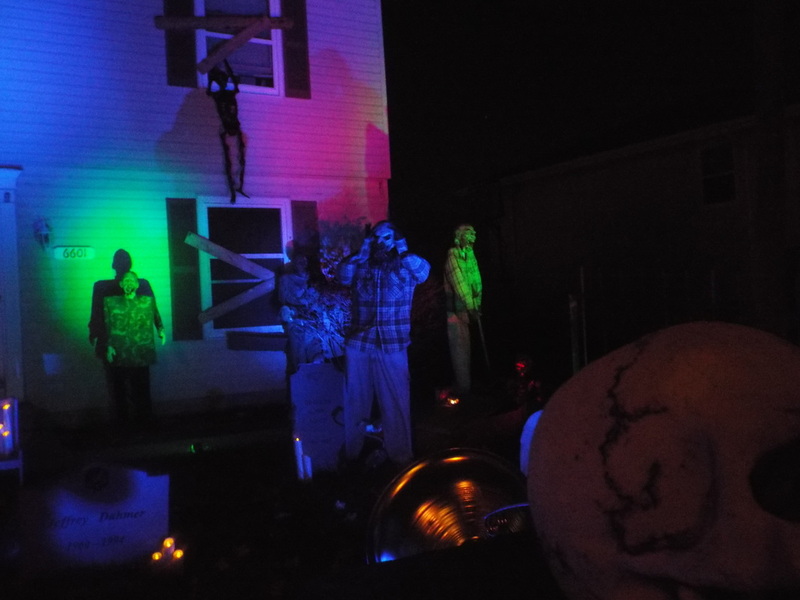 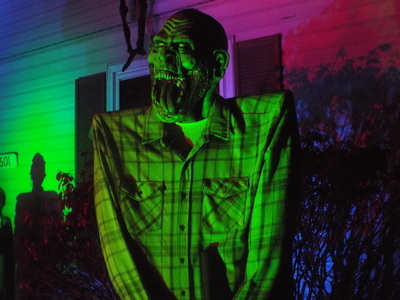 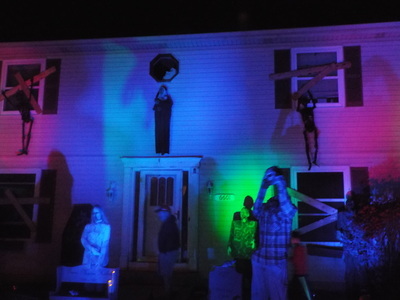 This particular display encompasses not only the front and back of the haunt property, but also the garage as well, and features a variety of both static and animated props. 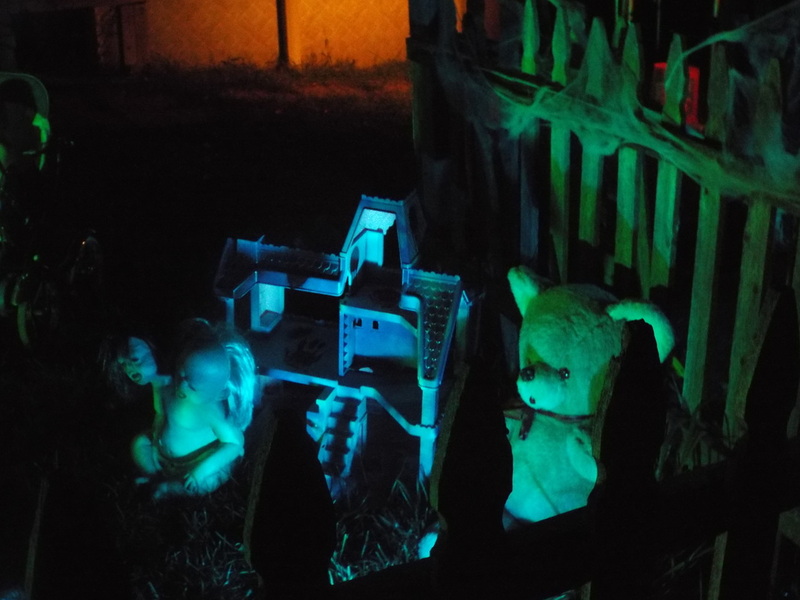 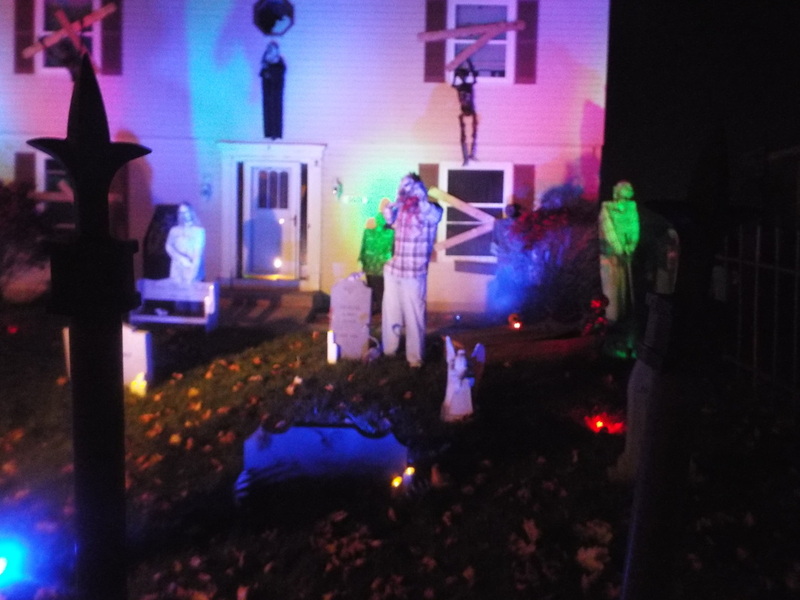 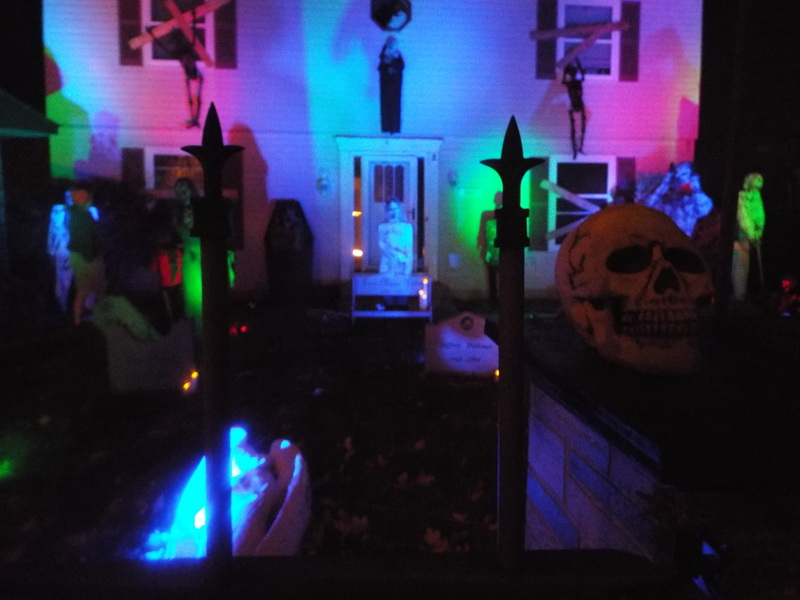 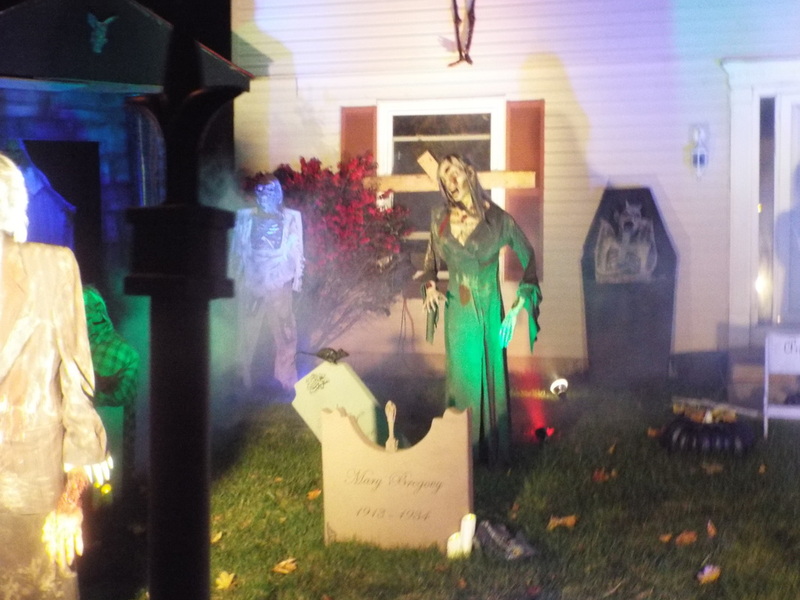 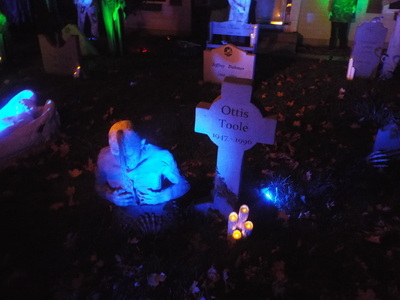 The entire front of the display is set up like a graveyard, and features various tombstones and figures, all accented by some creepy lighting and surrounded by a simulated wrought iron fence. 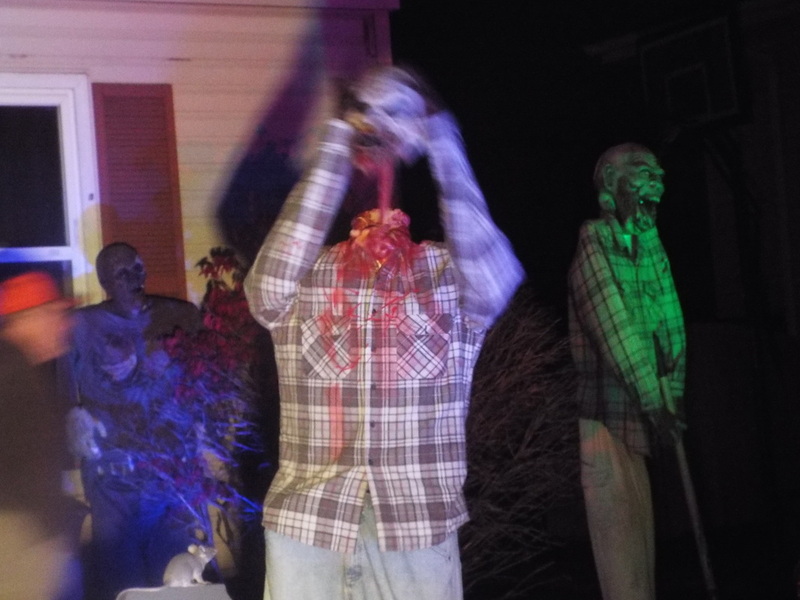 Our favorite part of this display was a figure we've not seen at other haunts, which was a guy taking his own head off of his body and placing it back on. 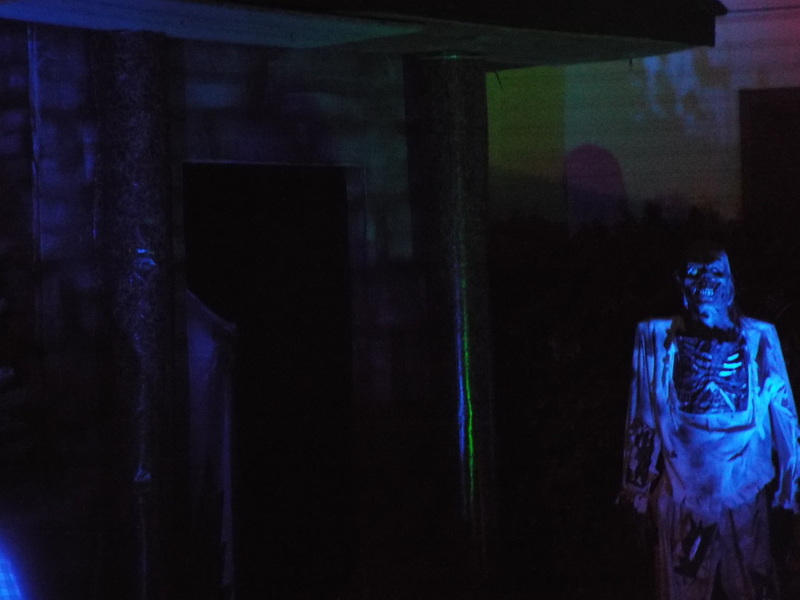 From a distance it actually looked like a live actor, so we had to do a double take! 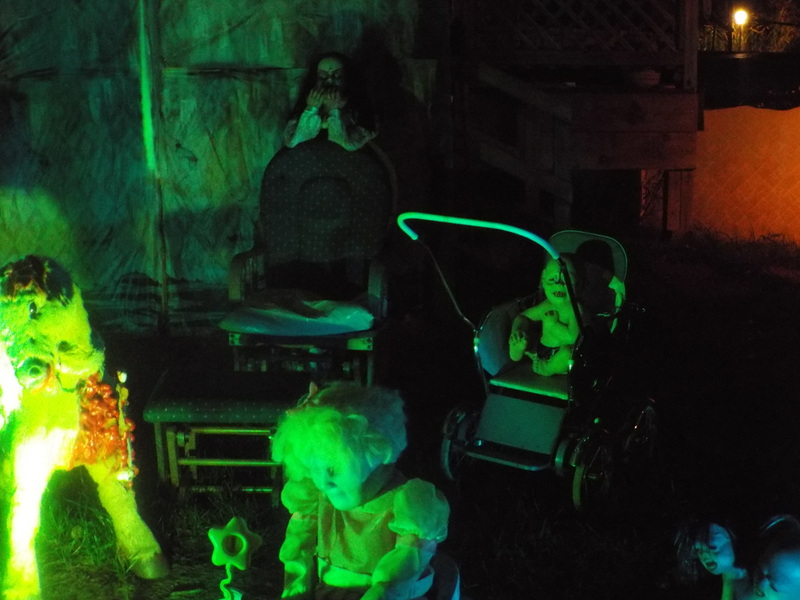 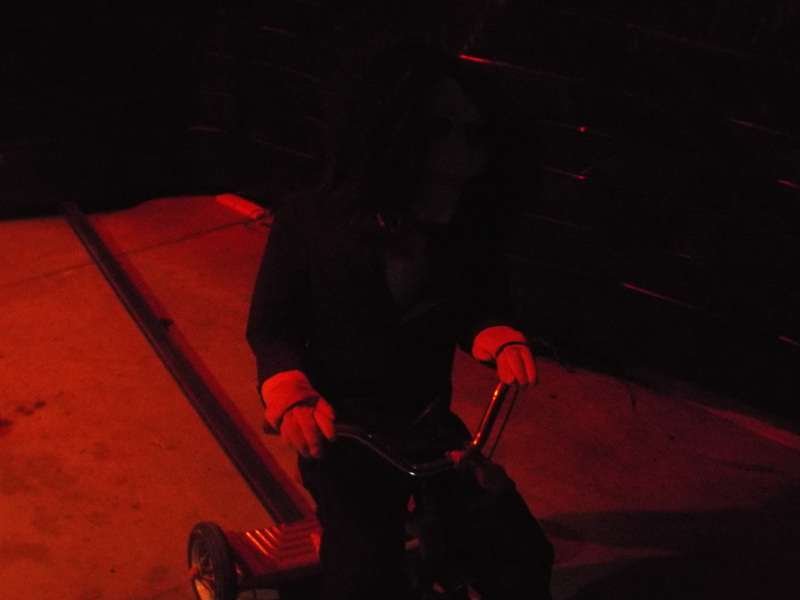 Following the display around to the back of the house, there was a smaller setup featuring demon babies in cribs, strollers, and high chairs. 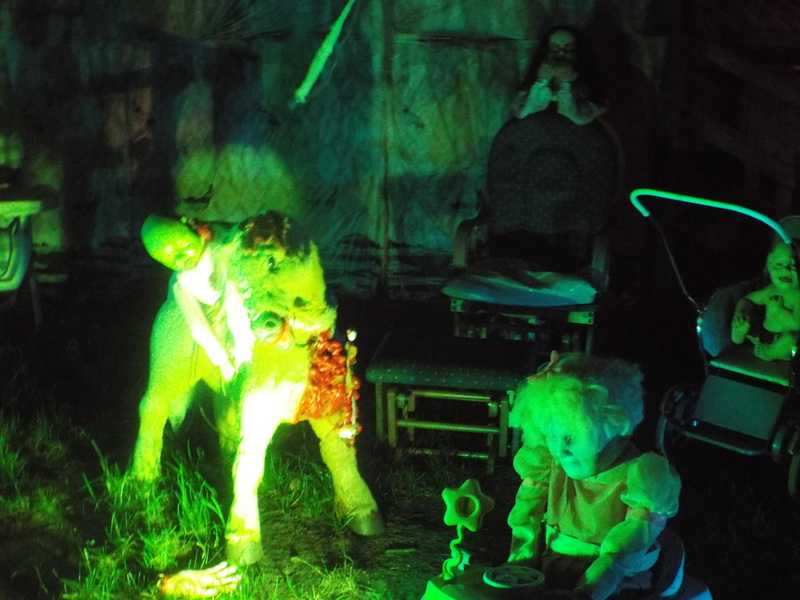 While we've seen this type of display before, Resurrection Cemetery again provided us with something new in the form of a baby riding a large stuff horse that looked like it had larges bites taken out of it. The sight of a stuffed horse with gory entrails hanging from it was somewhat surreal, to say the least! Our favorite part of the display was the garage setup, which featured the opening scene from the movie Saw V. Basically, this scene features a hapless victim chained to a rack with a large pendulum swinging above him. 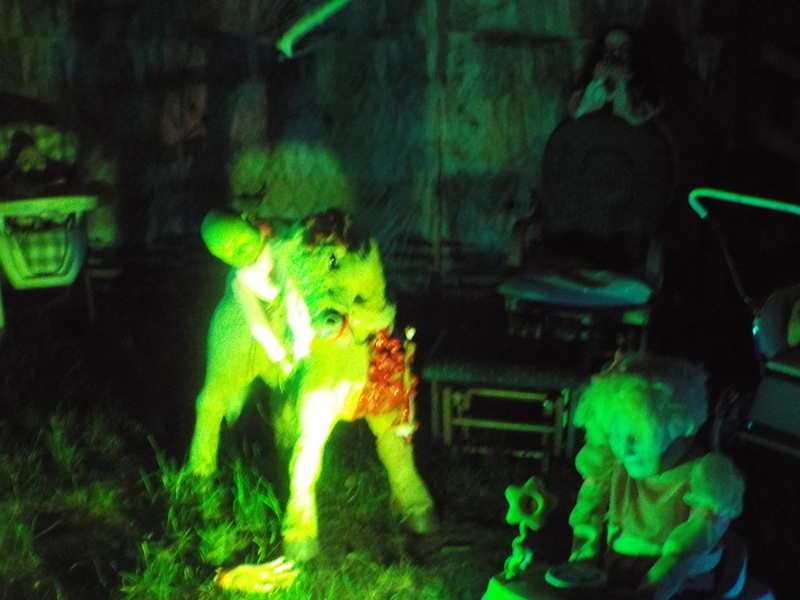 He is forced to puncture his hands with spikes in order to be able to free himself which, of course, he is unable to do in time. 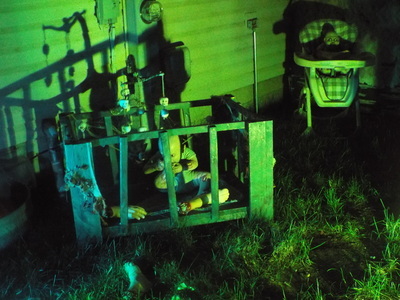 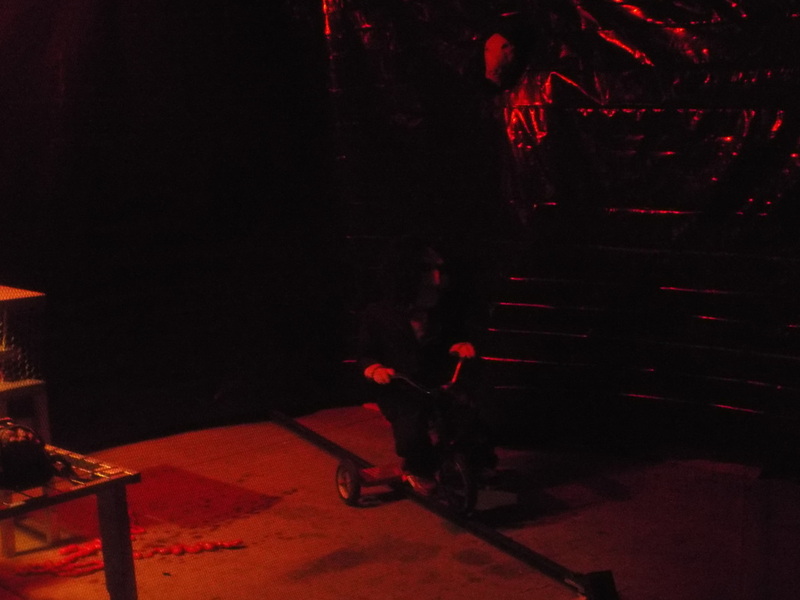 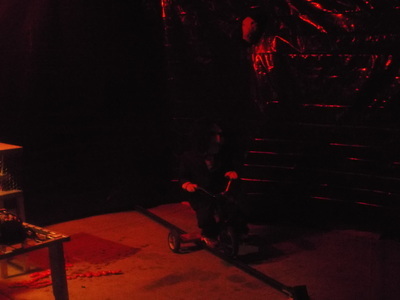 The display featured not only the victim, but pendulum, the clock on the wall indicating the time he had left, and even the saw guy on a tricycle in the corner. 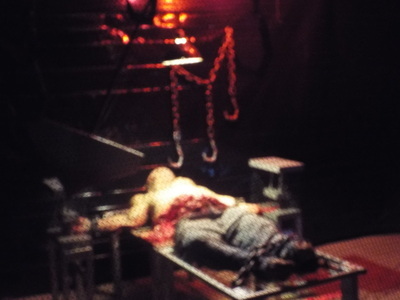 The entire scene was very well crafted, and looked quite realistic as well, And just in case visitors wanted to check the accuracy of the display, the opening scene from Saw V was even playing on a monitor on the wall. Overall, Resurrection Cemetery was a very creative and unusual display, combining some unique elements and culminating in a great garage scene. We thoroughly enjoyed our visit and look forward to next year to see what new items the owners come up with!